Way back in the early days of my GPS artwork journey (that is, a little over four months ago), I planned and rode each of my creations as one continuous line. No Garmin OFF/Garmin ON to connect the dots where the roads didn’t cooperate or to iron out unwanted lumps and unusual angles. I just worked within the confines of the city grid, for better or for worse. So it was with GPS doodles like “wicked witch of the West Coast,” my Strava selfie and the sultry woman that I sketched at the request of a fellow cyclist. And so it was with this simple tree, which I mapped out a couple months ago but only got around to riding today. Without all the stopping and starting required for more detailed works, this one felt fast and free-wheelin’! 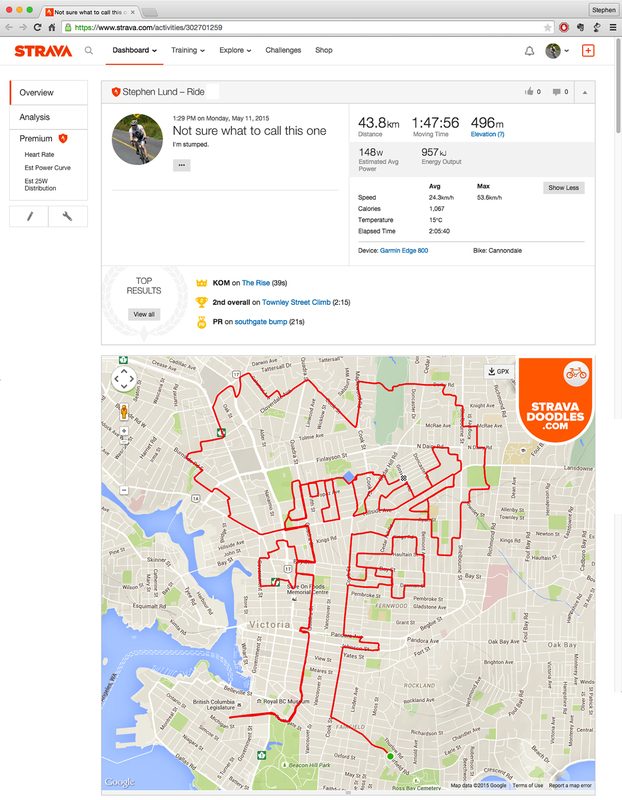 This entry was posted in Uncategorized and tagged creativity, cycling, cyclist, garmin, gps, gps art, landscape, strava, strava art, tree, victoria bc. Bookmark the permalink.